It’s a wine that is known for it’s incredible taste and beautiful heritage that becomes more and more popular in the US. Distinctively known as home to Argentina, Malbec is an exquisite red wine and the only red that I know of where the grape ties so closely back to it’s origins. It has a beautiful red violet color with a depth in taste yet still remains fresh and “deep” berry flavors (blackberry, boysenberry, plum). The grape’s importance to its culture makes this wine that much more enjoyable to drink because of it’s story and provenance. 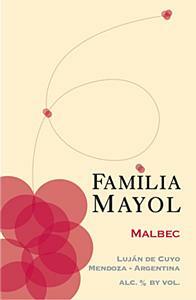 One of my favorites full of berry, spice, sweet tannins with a long last finish – Familia Mayol Malbec Mendoza 2008. Even the label is beautiful and comforting…. Try it out with a family style dinner of a hearty pasta or an assortment of cheeses.. Delectable!